Jerusalem municipality allows protest tent outside Prime Minister’s Residence to continue, despite shutting it down in the past. 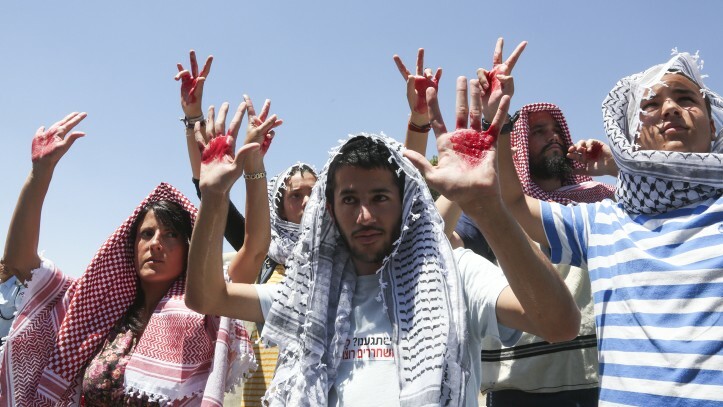 The Jerusalem Municipality has allowed the protest tent outside the Prime Minister’s Residence to remain open, it was revealed Sunday afternoon, as long as the bereaved families involved organize the protests ahead of the fourth batch of terrorist releases. Bereaved families have continued to protest over Israel’s release of 104 Palestinian Arab terrorists, 78 of which so far have been released. The protest tent outside the Prime Minister’s House, in particular, has received a slew of publicity over the past several months, as leading politicians and representatives for terror victims have used the site as a rallying point against the widely unpopular precondition to peace talks. The municipality has threatened to shutter the protest tent in the past, causing a media uproar. But this time – amid a general public outcry against the fourth batch of releases and a chance that the release will be canceled – the municipality made clear to Arutz Sheva that there are no plans to oust bereaved families from the site. Rather, a municipality representative said, the permit for the tent to stay outside the residence is simply due to be extended. ​Palestinian Authority chief negotiator Saeb Erekat stated earlier this month that Chairman Mahmoud Abbas was staying in talks solely for the sake of the terrorist releases, prompting Israeli officials to reconsider completing the deal – which has always been contingent on real progress in the talks. Over the weekend, Israel told PA officials that the deal was postponed, after Prime Minister Binyamin Netanyahu said the release would “topple the government” due to public and political backlash. Israel refrains from conducting fourth stage of prisoner release on Saturday as originally scheduled • Palestinian official to Israel Hayom: U.S. and Israel holding intensive discussions on release, which is still likely to take place sometime this week. Israel did not conduct the fourth stage of the prisoner release on Saturday night, prompting anger among Palestinians. Some 26 imprisoned terrorists were supposed to have been released in the fourth and final stage of the release that was agreed to as part of the renewal of Israeli–Palestinian peace negotiations last July. However, Israel decided to refrain from carrying out the fourth stage until it becomes clear whether the Palestinians intend to agree to a one-year extension of the negotiations, currently set to end next month. A Palestinian official told Israel Hayom that the Palestinian Authority has acquiesced to an American request for the release to be delayed a few days, and said that the release would still likely take place sometime this week. He said the U.S. and Israel were holding intensive discussions on the issue and he declined to elaborate on whether Israeli Arab prisoners would be included in the release. Palestinian Authority Prisoners Affairs Minister Issa Qaraqe said the Palestinians were waiting for Israel and the U.S. to finish deliberating on the fourth stage of the prisoner release. The Palestinian Authority did not comment on a report that Israel had offered to release 400 more prisoners in exchange for an extension of the peace talks. Meanwhile, the London-based pan-Arab newspaper Al-Hayat reported that U.S. Secretary of State John Kerry had delivered a message from Netanyahu to Palestinian Authority President Mahmoud Abbas. The message reportedly said that there was a chance Netanyahu’s government would collapse if Israeli Arab prisoners were released. The report also said that Kerry was proposing a new formula to the Palestinians that would not demand implicit Palestinian recognition of Israel as a Jewish state. The new wording defines Israel as the “national homeland of the Jewish people,” the report said. The proposal also includes the establishment of a Palestinian capital in an east Jerusalem suburb, rather than in east Jerusalem itself. The Palestinians reportedly rejected this proposal and refused to discuss it. The Washington Post reported that Kerry and his staff have warned Israeli officials that if the negotiations fail, the U.S. would be unable to prevent unilateral Palestinian efforts to seek statehood recognition from U.N. institutions. Also over the weekend, the Israel Defense Forces bolstered its presence throughout Judea and Samaria, due to concerns about potential unrest on Land Day on Sunday. Min. Yisrael Katz (Likud) notes date set for release has passed, says terrorists should be killed or jailed, not freed. Minister of Transport Yisrael Katz (Likud-Beytenu) noted with satisfaction Saturday night that the date set for freeing the fourth and final tranche of Palestinian Arab terrorist prisoners has passed without them having been released. “We passed the set date yesterday and no terrorist was freed,” he said. “Not [Marwan] Bargouti, not the Israeli terrorists and not the rest of the terrorist murderers. “Jew-killers belong between the crosshairs of a gun, and if not that—then in jail,” he stated. 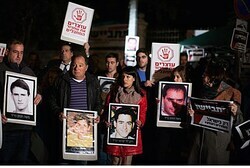 Terror victims’ organization Almagor held a rally of identification with the bereaved families protesting outside the Prime Minister’s Residence in Jerusalem Saturday evening. The families demand that the murderers of their loved ones remain in jail. Following the rally, students and members of youth movements were planning to sing old Zionist songs with the families. Participants in the rally include Rabbi Yehuda Ben Yishai, father and grandfather of the Fogel family martyrs from Itamar, and Dr. Aryeh Bachrach, head of the bereaved parent’s forum in Almagor, who his due to report about the planned demonstrations against the possible fourth tranche of releases. The Almagor terror victims’ organization announced on Thursday evening that it intends to continue next week its protests outside the Prime Minister’s residence against the planned release of terrorists as a “gesture” to the Palestinian Authority. “So long as Kerry is hanging around the region, we are uncomfortable,” said Almagor chairman Meir Indor. He added that the next protest rally against the release is scheduled for Saturday night and will be attended by bereaved family members of terrorist victims, as well as by members of youth movements. “We are teaching our children that Jewish blood is not sacred,” says sister of murder victim whose three killers were freed in previous deals. Amid enraged chants of “Shame on you!” hundreds of Israelis gathered in front of the Prime Minister’s Residence Wednesday evening to denounce this coming Saturday’s fourth and final release of 104 convicted Palestinians terrorists. Standing before a phalanx of protesters hoisting dozens of poster-sized images of murdered loved ones, Gila Molcho, whose brother’s three killers were freed during the 2011 exchange for soldier Gilad Shalit and first and second rounds of the latest releases, could not contain her rage. Molcho warned of the self-defeating nature of the releases, which she said sends a clear message to young Palestinians that murdering Jews will result in celebrity status and a better life. As she watched passersby walk past the protest, she excoriated them for their apparent apathy. “I feel like I want to take every person walking past us and shake them!” she said. “It’s my problem today, but it might be your problem tomorrow!” Indeed, Ornit Gesundheit said she attended the demonstration to protect future victims of terrorism. “The most important reason I’m here is to save the lives of the people who will be killed if those terrorists are released,” she said. Her friend, Leora Cohn, expressed disillusionment over the final release. Michael Grossman, a former paratrooper, expressed outraged incredulity that Israel is held to a standard not enforced anywhere else in the globe. “There’s no way in a normal world that [governments] would release murderers like this—it’s outrageous!” he said. “When I was in the army we captured these terrorists, who were trying to kill little kids—or any other innocent person they could—and now we’re supposed to let them go?” David Jacobs, whose 19-year-old son is serving in the IDF, similarly asked, “Why should he risk his life every day to catch terrorists, if the government is going to release them?” Jonathan Benedek condemned US Secretary of State John Kerry and the Obama administration for pressuring Prime Minister Binyamin Netanyahu into agreeing to the releases. Moreover, Benedek contended that setting such a precedent of acquiescence will set a dangerous standard for future negotiations. Meanwhile, with respect to speculation that the Obama administration may free Jonathan Pollard as a concession for the released terrorists, Meir Indor, chairman of Almagor Terror Victims Association, said Pollard would rather stay imprisoned than be used to release killers. “Pollard himself said he wouldn’t want that—that he’d agree to more time in prison instead of this deal, because he doesn’t want blood on his hands,” Indor said. Arab League expresses support for Palestinian Authority President Mahmoud Abbas’ refusal to recognize Israel as a Jewish state • Israeli official: Fourth stage of prisoner release to take place only if Palestinians agree to extension of peace talks. Just a day after Palestinian Authority President Mahmoud Abbas reiterated his refusal to recognize Israel as a Jewish state, the Arab League backed his rejectionism on Wednesday, declaring an “absolute rejection” of any recognition of a Jewish state. Abbas—who spoke at the start of the summit and declared that “the peace process is on the verge of collapse”—met on Wednesday in Amman with U.S. Secretary of State John Kerry, who interrupted a trip to Italy to fly to the Middle East to try to salvage the faltering Israeli-Palestinian peace negotiations. Kerry arrived in Jordan to ask Abbas to commit to an extension of the peace talks. Kerry and Abbas spoke for more than four hours over a working dinner in Amman that U.S. officials said was “constructive.” No other details of the meeting were released. Kerry also spoke by telephone with Prime Minister Benjamin Netanyahu during the three-hour flight from Italy to Jordan, U.S. officials said; the two were due to speak again after Kerry dined with Abbas. While in Amman, Kerry also meet with Jordan’s King Abdullah II, back from the Arab League summit in Kuwait. “The path to a just peace goes through the establishment of the State of Palestine,” Abdullah said. An Israeli official, however, said Israel would go ahead with the release, and is ready to “restrain construction” outside the settlement blocs (without an official government decision on the matter), if Abbas agrees to a one-year extension of the peace talks. Netanyahu has refrained from publicly commenting on the prisoner release, and the decision on whether to go ahead with it or not, with or without Palestinian agreement to an extension of the peace talks, will likely be made only at the start of next week. 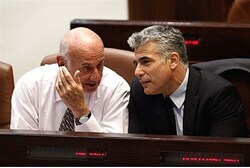 Interior Minister Gideon Sa’ar (Likud) on Wednesday expressed vehement opposition to any sort of constriction freeze. Will US Free Pollard in Effort to Keep Peace Talks Alive? U.S. denies Army Radio report that it has agreed to release Israeli spy Jonathan Pollard as part of a deal to prevent a collapse of the Israeli-Palestinian peace talks • U.S. Secretary of State John Kerry meets with PA President Mahmoud Abbas in Amman. As part of an effort to prevent a collapse of the current Israeli-Palestinian peace talks, the U.S. has agreed to release imprisoned Israeli spy Jonathan Pollard, Army Radio reported on Wednesday. According to the report, which was later denied by the U.S., the American move is meant to try and buy time for the faltering negotiations, in light of extreme statements made Palestinian Authority President Mahmoud Abbas, who refuses to recognize Israel as a Jewish state, and the reluctance of Israel to go ahead with the fourth stage of the release of imprisoned Palestinian terrorists at the end of this week. The Army Radio report suggested that should Abbas agree to extend the peace talks until the end of the year, and Israel agrees to proceed with the fourth stage of the prisoner release, including 20 Israeli Arab prisoners, the U.S. would free Pollard. Army Radio quoted Israeli officials as saying Prime Minister Benjamin Netanyahu would likely be able to secure his government’s support for such a deal, as the Israeli public would likely support a move that results in Pollard’s release. Pollard, now 59, was arrested in Washington in November 1985. He was later convicted of spying for Israel and sentenced to life in prison. Meanwhile, U.S. Secretary of State John Kerry cut an official visit to Italy short on Wednesday to fly to Jordan to meet with Abbas. A senior Jordanian official told Israel Hayom that the meeting in Amman would include a video conference with Netanyahu, and that King Abdullah II would also participate in the meeting. “The meeting will focus on Israel’s obligation to free [Palestinian] prisoners at the end of the month and it will be crucial to the future of the peace talks,” the official said. The fourth stage of the prisoner release, which remains uncertain at this point, has been touted as the Palestinian leadership’s top priority. Both Jordanian and Palestinian officials have expressed pessimism regarding the release. “Right now it doesn’t look like the fourth [prisoner] release will take place because Israel is against it,” a Palestinian official told Israel Hayom. Speaking before an Arab League summit in Kuwait on Tuesday, Abbas accused Israel of “trying to avoid fulfilling the commitments it made to the Americans to release prisoners. The Israeli government is trying to thwart the prisoners’ release and it only goes to show that they are not serious,” he said, referring to the peace talks. Israeli government ministers are pressuring Netanyahu to delay the release by at least a month, until Abbas clarifies whether or not he is willing to extend talks by a year. The Knesset Interior Committee was set to discuss on Wednesday the criteria for the potential four stage of the prisoner release. Committee head MK Miri Regev (Likud) invited representatives from the Israel Prison Service and from the Prime Minister’s Office to discuss the release. Also invited to the meeting were representatives from the Attorney-General’s Office, from the Public Security Ministry, from the Foreign Ministry and from Almagor Terror Victims Association, which strongly opposes the prisoner release. Almagor head Meir Indor echoed Regev’s statements. “I feel like not only have we betrayed our own values, but we’ve betrayed our country,” says demonstrator at vigil in front of PM’s Residence. “This should be acceptable and understandable logic to any reasonable person,” he added, with rage and sorrow inflaming his eyes. Ben-Yishai was joined by dozens of other demonstrators Sunday afternoon at a vigil in front of the Prime Minister’s Residence in Jerusalem to condemn Saturday’s fourth and final round of releases of convicted Palestinian terrorists. To date, approximately 75 of the 100 convicts have been released as a precondition for ongoing peace negotiations, resulting in three previous emotionally fraught vigils arranged by the Almagor Terror Victims Association, headed by chairman Meir Indor. However, at Sunday’s fourth gathering, Indor expressed hope that overwhelming public opposition to the final release may gain enough traction to prevent it from coming to pass. “We have a feeling that this time we might see a change because polls are showing that 80 percent of Israelis are against releasing terrorists,” he said, a few meters from makeshift tent scheduled to be manned until Thursday night. Indor added that the egregiously insensitive celebrations among Palestinians for the previously released terrorists, compounded by their monetary compensation by the Palestinian Authority, should serve as irrefutable evidence that the releases are counterproductive. “We’re seeing that it doesn’t pay to release terrorists because they are getting the reception of heroes and large sums of money, so the lesson to young Arabs is: ‘Join the terror group, kill a Jew and you’ll be celebrated and receive money.’” Even if those released don’t kill again with their own hands, Indor said they become alluring “spiritual leaders” who attract “fresh blood” to murder in their stead. Noting the uptick in terrorist attacks in the West bank and Gaza Strip following the preceding prisoner releases, Indor said the Israeli government is ostensibly perpetuating a cycle of violence by agreeing to the terms. Asked what he would say to Prime Minister Binyamin Netanyahu if given the opportunity, Indor said he would restate the prime minister’s own words cautioning about the profound dangers of releasing terrorists. Acknowledging the acute pressure and hypocrisy Netanyahu is facing by the US government, Indor implored him to not yield to the duress. “Be brave against the pressure from [US Secretary of State] John Kerry and the American government,” he said. “Tell them: ‘You don’t do this in your country, so don’t force us to do it in ours. American justice would not accept this, why should Israeli justice? Because Jewish blood is cheap?’” Observing the close-knit nature of Israeli society, Ortal Kramer, a 22-year-old college student, said she missed class to attend Sunday’s vigil to show solidarity with all Israelis who have been afflicted by terrorism. “I think every person in our country knows someone personally who has lost a loved one to terrorism,” she said. Echoing Indor’s sentiments, Kramer expressed incredulity over the government’s agreement to release convicted killers. “I can’t believe this is the situation we are in,” she said. Moreover, Kramer contended that the releases are driving young Israelis away from the country by draining them of hope. Kramer added that the releases are antithetical to Zionist ideology. “It was our grandparents dream for us to live here and they wouldn’t have wanted us to leave because of this,” she said. Indeed, Ortal Tamam, whose uncle was murdered by terrorists in 1984, said the prisoner releases not only negate Jewish values, but are robbing Israelis of hope. Families with members who were terror attack victims hope to speak with Prime Minister Netanyahu before he releases more terrorists. Families who have members that were killed in terror attacks have set up a protest tent outside the Prime Minister’s Residence in Jerusalem—and they are inviting Binyamin Netanyahu to come into the tent and discuss his plan to release yet more Palestinian terrorists. Next week, Israel is set to release a fourth batch of terrorists from prison. As a “concession” to persuade Abbas to resume the talks after a three year hiatus, Israel agreed last summer to release some 100 terrorists from its prisons, in four batches. The last batch is set to be released at the end of March, but Netanyahu is under pressure from his ministers to cancel that release. Netanyahu is under great pressure from US President Barack Obama to go through with the release; the White House is very concerned that the PA could end talks at any moment, and has made it clear that if the terrorists are not released, all talks will cease. According to Indor, 80% of Israelis are against an additional release of terrorists. “We are protesting to impress upon Netanyahu our opposition to further releases, and to support those of his ministers who are against it as well,” Indor added. Members of the Almagor terror victims organization meet Ministers Lapid and Perry, ask them to reconsider upcoming terrorist release. Members of the Almagor terror victims organization, who lost their relatives in terror attacks, met on Thursday in Tel Aviv with Ministers Yair Lapid and Yaakov Perry of Yesh Atid. The bereaved families asked the two ministers to reconsider the planned release of the fourth batch of terrorists from Israeli prisons. Israel agreed to release 104 terrorists in four batches as a “gesture” to Palestinian Authority (PA) Chairman Mahmoud Abbas so he would hold peace talks with Israel. Three releases have already gone through. During Thursday’s meeting, Lapid told the families that the Cabinet had yet to vote on the release of the fourth tranche. Perry, formerly the head of the Israel Security Agency (Shin Bet), told the families that are in any case, terrorists with Israeli citizenship will not be released. A senior diplomatic source said this week that if it turns out that talks with PA have reached a dead end, Israel will reconsider the fourth terrorist release. There have been growing calls on the Israeli government to cancel the upcoming release, especially given the fact that several senior PA sources have openly said their only motivation in the talks was to release the 104 prisoners, not to reach an agreement with Israel. Justice Minister and chief Israeli negotiator Tzipi Livni said that the PA would need to prove its commitment to talks to secure the final batch. Meir Indor, the chairman of Almagor, told Arutz Sheva following Thursday’s meeting with Lapid and Perry that the meeting was a difficult one due to the pain of the bereaved families. The bereaved families will march on Monday near the Park Hotel in Netanya, where a Hamas suicide bomber, who had served time in an Israeli prison and was released, carried out in 2002 one of the biggest terror attacks in history during a Seder which took place at the hotel. 30 Jews were killed in the massacre. Next Wednesday, the families plan to protest outside the prime minister’s home, Indor said. Deputy Defense Minister Danny Danon this week declared that he would resign his post if the government went ahead with yet another round of releasing terrorists. Sources close to Prime Minister Binyamin Netanyahu responded to Danon’s threat by saying that even if he does not resign, Netanyahu intends to fire him. If releasing terrorists will bring peace, then that is what must be done, says Dr. Aryeh Bachrach of Almagor. But everyone knows it won’t. In an interview with Arutz Sheva Thursday, Dr. Aryeh Bachrach, whose son was killed in a terror attack in 1995, sent a plea to Prime Minister Binyamin Netanyahu: Do not release more Arab terrorists at the end of the month, as the Palestinian Authority is demanding, and as Netanyahu committed to do last year. This will be the fourth time Israel is set to release terrorists in the latest “round” of releases, which began last year. Israel committed to releasing over 100 terrorists, many responsible for the deaths of multiple Israelis, as a “gesture” to tempt PA chief Mahmoud Abbas to restart talks with Israel after a three year hiatus. So far, Israel has released more than 75 terrorists, and another 26 are set to be released within a few weeks. Over the years, said Bachrach, head of the Almagor Bereaved Parents’ Forum, precious little attention has been paid to the feelings of parents who have lost children to terrorist attacks. It’s time for that to change, he said. “My message to the Prime Minister is that if, sir, you are convinced that releasing terrorists will bring true peace, then it certainly should be done. Obviously you must act in accordance with what is best for all Israelis. In such a case you must ignore the feelings of people like me. “But you know as well as I do, as 99% of the people I come into contact with from all political points of view, that the only thing releasing terrorists will do is provide you with another opportunity to sit at the same table with the Holocaust denier Mahmoud Abbas,” said Bachrach. “We are paying with precious Jewish blood for this ‘opportunity.’ I call on you to prevent another travesty of releasing terrorists,” he said. Bachrach’s son Ohad, along with friend Ori Shahor, were killed in 1995 when they were hiking in Wadi Qelt east of Jerusalem. The PLO’s Popular Front for the Liberation of Palestine faction claimed responsibility for the murders. Bachrach, of Beit El, was 18 when he was killed, and Shahor, of Ra’anana, was 20. Opposition to fourth stage of prisoner release growing within government • Palestinians publish a list of prisoners to be released at the end of March, including 14 Israeli Arabs • Netanyahu: World starting to understand that Abbas is not ready for peace. Following the meeting of Palestinian Authority President Mahmoud Abbas with U.S. President Barack Obama in Washington earlier this week, Israel is warning it may cancel the fourth stage of the prisoner release if Abbas refuses to commit to a year-long extension of the current peace negotiations. The fourth stage of the prisoner release is scheduled for the end of the month, and it is still unclear if Israel has plans to release Israel Arab prisoners, which U.S. Secretary of State John Kerry promised to the Palestinians. The Palestinians have already published a list of the prisoners to be released at the end of the month. According to the list, 14 Israeli Arabs from cities including Ramla, Kafr Qasim and Umm al-Fahm are set to be released. Among those on the list published by the Palestinian Authority are Muhammad Jabarin, Yahya Agbaria and Ibrahim Agbaria, arrested in 1992 for taking part in the “Night of the Pitchforks,” during which they murdered three Israeli soldiers. Also listed is Karim Younis, who murdered Israeli soldier Avraham Bromberg in 1981. In Israel, no official list has been published, and any list will be reviewed by the government before it is released to the public. Opposition to the fourth stage of the prisoner release is growing within the Israeli government. Habayit Hayehudi ministers have expressed a strong stance against the release, and several ministers from the Likud are echoing the sentiment. Deputy Defense Minister Danny Danon (Likud) threatened to quit if the fourth stage of the release is carried out. “If they are released, I will resign from my position,” he said. 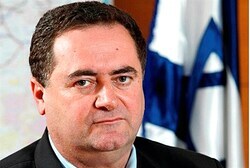 Transportation Minister Yisrael Katz (Likud) also opposes the release. “It is moral bankruptcy to release [former Fatah leader] Marwan Barghouti and his friends in order to continue the talks,” he said. Israel Prison Service responds that Palestinian report not official; terror victims group requests clarification from Livni. The Palestinian Authority published on Tuesday a list of 30 terrorists it expected Israel to free in a fourth and final prisoner release at the end of the month. The list reportedly included 14 Arab Israelis and four Palestinians from east Jerusalem. Jerusalem has until now adamantly refused to free Arab Israelis as part of the releases, which Israel committed to as a goodwill gesture for resuming the current round of peace negotiations. Of the long-serving prisoners on the list of convicted murderers were the Israeli-Arab cousins Kareem and Maher Younis who received life sentences in 1983 for stabbing to death two years earlier the IDF soldier Avraham Bromberg. Also among the listed Arab-Israeli prisoners with “blood on their hands,” was a resident of the Wadi Ara village of Baka al-Gharbiya who was sentenced to life imprisonment after being convicted for the abduction and murder of an Israeli soldier in 1984. The last batch of convicted Palestinian murderers was expected for release by March 29. The Israel Prison Service responded that the Palestinian report was not official and that they could not confirm that those on the list were indeed being released. Indor said that Almagor believes there is not a majority in the government to release Arab-Israeli murderers. He said that he was meeting with Justice Minister Tzipi Livni on Tuesday to see if the Palestinian claims are true. Justice Minister Tzipi Livni will meet on Tuesday with representatives of the Almagor terror victims’ organization. The meeting comes ahead of the next scheduled release of terrorists as a “gesture” the Palestinian Authority (PA). Lt. Col. (ret.) Oren Tamam, brother of Moshe Tamam who was kidnapped and murdered by terrorists, said on Monday that the meeting was finally scheduled after months of repeated requests. Terror victims group slams Arab MK attacks in Knesset debate on airport security, warns that groups are weakening security. The “hazing” occurred during the discussion of the Public Complaints Committee, chaired by MK Adi Kol (Yesh Atid), which centered on the topic of security checks at airports. Arab MKs claimed Arab citizens of Israel are disproportionately targeted for security checks. Indor told Arutz Sheva that the debate, which bordered on verbal violence at several junctures, was punctuated by Arab MKs shouting and attacking representatives of the security forces, preventing them from responding. At the end of the discussion, Kol decided the Arab MKs would hold a demonstration for airport security guards to “demonstrate the feelings” of those undergoing focused checks. Indor mentioned that during the discussion, airport representatives reported that such lectures are already being conducted. Indor himself got involved in the debate, speaking out for the security forces specifically as someone not associated with them, and therefore able to freely express his opinion. For example, he argued that there is certainly a need to target Arab passengers at airport security checks, in contrast to the tone of the debate. Historical truth teaches there have been numerous attacks and attempted attacks by Israeli-Arabs on public transportation, thereby justifying heightened security alertness concerning them, whereas Jewish passengers have not been behind such attacks, according to Indor. Indeed, a survey last June found 58% of Israeli-Arabs support an intifada violent uprising against Israel, while 70% do not accept Israel’s right to maintain a Jewish majority. Indor argued that leftist organizations and lawyers have been revealed as using Knesset committees to push the rights of the individual in an attempt to weaken the security needs of Israelis. “There is a web of organizations whose role is to melt Israel’s ability to defend itself,” said Indor at the debate. When asked by Kol if he intended to accuse the leftist groups of supporting terror, Indor responded that even if that wasn’t their goal, the result of their actions is certainly support for terror. 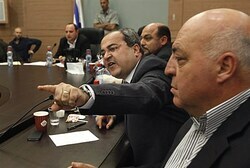 The discussion also revealed that a group of “VIP” Arabs are not subject to the intense security checks, reports Indor. This group of Arab passengers includes journalists and others. Indor noted that former Palestinian Authority (PA) Chairman Yasser Arafat was also given the VIP status, which he used to smuggle weapons and terrorists. Indor made clear he was not accusing the Arab journalists of similar intentions. “While the Jewish MKs are quarreling over the (hareidi) enlistment law, they’re doing things here to harm the security of the country,” warned Indor. He called on all those interested in joining the effort to expose the damaging discussions to contact his group Almagor, where they would be directed by legal experts and politicians to prepare them for taking part in committee discussions. The debate on Wednesday was not the first example of Arab MKs turning a committee discussion into a circus. Arab MK Jamal Zahalka (Balad) was let off with a warning for his antics last November, when he verbally attacked other MKs and even tried to push them out of a committee discussion. The accusations against the state are also not new; just this week MK Hanin Zoabi (Balad) accused Akko of not renovating a destroyed house as part of a plan to expel the city’s Arab residents. Cpl. Avraham Bromberg was heading back from his army base in the Golan Heights to his home in Zichron Yaakov on November 26, 1980, when a number of men jumped him. Bromberg struggled with his attackers, but was overpowered and shot in the head, his weapon stolen. He was found on the roadside and died in hospital two days later. Sentenced to life in prison in early 1983, Karim Younis from the Arab town of ‘Aara in central Israel is now the longest serving security prisoner in an Israeli jail. He carried out the attack on Bromberg as a member of the Fatah movement. Younis is one of 14 Arab Israelis convicted of terrorism before the signing of the Oslo Accords in September 1993. According to an understanding reached between the Palestinians and Israel and brokered by the United States ahead of the current round of negotiations, all 104 pre-Oslo security prisoners still held in Israeli jails are to be released by the end of March, when the last of four release phases is to be realized. Though the date for the release is quickly approaching, officials said this week that lawmakers are still far from holding a needed vote to approve the measure, which carries more weight than previous phases because it involves the release of Israeli citizens. Israel has held the Israeli prisoners coveted by the Palestinians for the last of the planned releases, remaining vague as to whether it would indeed let them go. Israel has always been reluctant to include its own citizens in prisoner exchange deals with the Palestinians, claiming that while the PA represented Palestinians living in its own territory, it could not speak for Palestinians living inside Israel. But that principle was broken in the prisoner swap over abducted Israeli soldier Gilad Shalit in October 2011. The deal saw 1,027 Palestinians freed from Israeli jails, including six Israelis and 14 residents of East Jerusalem. With peace talks set to kick off last summer, the Israeli cabinet approved the prisoner releases on July 28, 2013, with 13 in favor, seven in opposition, and two abstentions. In return, the Palestinian leadership vowed not to appeal for membership in international organizations for the duration of negotiations. Netanyahu appointed a small team of ministers, including Justice Minister Tzipi Livni, Defense Minister Moshe Ya’alon, Minister of Internal Security Yitzhak Aharonovitch and Science Minister Yaakov Peri — all of whom supported the deal — to determine the identity of the prisoners to be released in each of the four phases. To ease the blow, Netanyahu told his cabinet in July that any freeing of Arab Israelis will be brought to a second vote in the government. The last release is scheduled to take place on March 28. The Times of Israel spoke this week with media advisers for three Israeli ministers, all of whom did not know if or when a cabinet vote on the final release is scheduled to take place. Kobi Ellenbogen, a spokesman for Communications Minister Gilad Erdan, while unaware of a new vote, noted that Erdan was one of two Likud members who voted against the measure back in July. Nisan Zeevi, a spokesman for Science Minister Yaakov Peri, said such a vote is still “ages away,” noting that Peri had voted in favor of releasing 104 Palestinian prisoners even though “he was responsible for putting 95 of them behind bars” as head of the Shin Bet between 1988 and 1995. Zeevi said that he has so far not been approached by any Israeli lobbyists trying to change Peri’s vote next time around. But one such organization has already begun trying to convince cabinet ministers to oppose the final prisoner release. Almagor, an Israeli organization which advocates for families of terror victims, has unsuccessfully appealed to the Supreme Court to halt every previous round of releases. Today, it is trying to convince ministers who supported the move last July to oppose it over the Israeli terrorists expected to be included. Meir Indor, CEO of Almagor, said that according to his organization’s calculations, Netanyahu no longer has a majority in government for a fourth prisoner release. “It’s a very dangerous symbolic move which must be prevented in every way possible,” Indor told The Times of Israel. In his bid to convince Israeli ministers to oppose the measure, Indor characterizes it as not only immoral, but also ineffective in fostering Palestinian goodwill. Just Monday, Mahmoud Abbas told Israeli MK Zahava Gal-On that Palestinians will demand further prisoner releases as talks continue. “What have we gained? You [the Israeli ministers] wanted to avoid extortion, but he [Abbas] is already starting to extort. So there’s no point in continuing the process and it should be stopped now,” he said. Indor added that the remaining prisoners are the worst offenders yet, citing an Israeli poll showing that 80 percent Israelis oppose the move. Releasing Israeli terrorists — while understandable as part of a hostage predicament like Shalit’s — is inexcusable as an incentive for peace talks, he argued. The US is behind the massive pressure placed on the Netanyahu government to complete the freeing of pre-Oslo prisoners, Indor is convinced, noting that he has heard as much from Israeli ministers whom he would not name. Indor has asked US Ambassador to Israel Dan Shapiro to arrange a meeting with Secretary of State John Kerry in order to explain the position of bereaved Israeli families. Meanwhile, on the other side of the equation, MK Ibrahim Sarsur (Ra’am-Ta’al) was confident on Tuesday that the release would go forward on March 28, since Netanyahu will not be able to withstand the American pressure exerted on him. He said that Israel is expected to free 32 prisoners on that date, since during the previous installment on December 31 Israel decided to free six prisoners who were not on the original list of pre-Oslo detainees submitted by the PA. The US is adamant about the prisoner release because it realizes that it is the only means of safeguarding Mahmoud Abbas’s credibility on the Palestinian street. “As long as the Americans push this issue and don’t back down, Netanyahu will have to obey. He has no other choice,” Sarsur said. Last month, Sarsur became the first and only Arab MK to stand on the Knesset podium and call on Obama to release convicted Israeli spy Jonathan Pollard.